After Nick Swisher joined the Indians this past weekend, he became the fourth offensive piece from the 2012 roster to leave. While Russell Martin, Raul Ibanez, and Eric Chavez all were positive contributors with the bat, nobody’s production will be missed more than Swisher’s. Ichiro is set to be the opening day right fielder, meaning there’ll be a new man in at the position for the first time since Swisher replaced Bobby Abreu in 2009. However, a platoon could be in order if someone like Scott Hairston is brought in. Still, with Ichiro taking the bulk of the plate appearances, how much of a drop off will there be from Swisher? 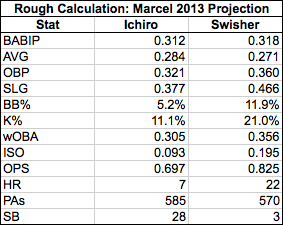 In 2013, Marcel projects Swisher to be a better overall hitter than Ichiro. This should come as a surprise to nobody. Marcel also tempers the enthusiasm that Ichiro’s finish to 2012 created, projecting him to hit below .300, infrequently reach base, and hit only 7 home runs. While I think it’s possible Ichiro could crank out a few extra long balls thanks to Yankee Stadium, it’s not like he’s going to balloon remotely near Swisher’s power production. Ichiro may provide a leg up in terms of contact and speed, but the loss of Swisher takes away one of the Yankees’ primary on-base and power threats. Brett Gardner‘s healthy return kind of makes him redundant to have along with Ichiro, although the outfield defense should be far better without Swisher and Ibanez playing substantial innings. Obviously, the $14M AAV Swisher receives from Cleveland doesn’t appear to easily fit into the Yankees’ austerity budget plans. And yes, another downside is that Swisher’s production will probably begin to drop off as he enters his mid-30s. But truthfully, there is no justification for giving Ichiro 2 years and $13M. The Yankees could have instead let Ichiro walk, and effectively be paying Swisher $7.5M AAV if they already were willing to sink $6.5M on the older and less productive Ichiro. Now, the Yankees are in a sticky situation with a lefty-laden lineup, and dwindling options on the open market. Why did they let Swisher go on such a reasonable contract? Back in August, I estimated a 4 year, $54M pact, and Swish only received $2M total more from Cleveland. Hypothetically, repeating everything else that already happened this offseason, with the exception of the Ichiro re-signing, Swisher could have been retained. Take a look at the tab Scenario A under our new “The Big, Bad, Austerity Budget” page to see how this works. What you’ll see: bringing back Swish at the same rate under the Cleveland deal, settling arbitration cases (Notably Gardner David Robertson), re-signing Cano to a 7 year, $150M deal, and inking Hairston to a 2 year, $8M contract still leaves about $27M for 9 more roster spots. It’s not as if the organization would be without any breathing room. Sure, Yankees fans are disgruntled about Swisher’s lack of postseason production, but that’s not how teams evaluate players. General Managers buy players for the regular season performance, not perceived ability in the clutch. Remember, you have to get to the playoffs first. Say what you want about his postseason struggles, but Swisher has been an integral part of the Yankees’ road to October since 2009. Losing and replacing him with a lesser caliber player, Ichiro, only makes it more difficult to return to the playoffs going forward. Any questions about the Marcel template I created or the payroll calculation? Comment and I’d be happy to answer any questions and/or show how I reached the figures discussed. This entry was posted in Austerity Budget, Offseason and tagged Nick Swisher. Bookmark the permalink. While I agree that Swisher would be better than Ichiro even with age factored in, I highly doubt Cano would be happy with a ‘7 year, $150M deal’. Cano is arguably the best right now and if he (likely) continues to perform in the coming season, I am sure he will easily be offered much more. And this will mean less money for other positions. Perhaps letting Swisher walk is to free up money for Granderson/Cano? Yea, letting Swisher go certainly more if a financial move than a talent move. While they probably could fit Swisher in with a Cano extension next winter, money would be tight. I’ve alluded to it in other articles, but letting Martin walk was more of a head scratcher than Swisher. As for the $ for Cano, it’s hard to estimate. He’s going to blow every other 2B contract in history out of the water, but does he deserve to approach the $200M mark? I’m not so sure. He’s older than most of the guys who obtained that kind of money at the time of signing, and there is concern about how middle infielders age. We’ll see what happens. It’s difficult to predict anytime Boras is involved. I am also hopeful that we can keep Cano. This Boras agent will get overpaid I’m sure. Love the site. Thanks for replying. Keep up the analysis! Will miss Swish and his bat! Love his personality too!